Looking for a portable low vision magnifier? Portable Low Vision Reading Magnifiers are perfect for on the GO reading and writing. Need to view a price tag at the grocery store or sign a credit card slip in the check lane? These portable low vision solutions are your answer. With these magnifiers you get a clear crisp picture every time. A flexible and portable laptop solution for reading, writing and viewing magnified images at any distance. Transformer is compatible with most popular magnification software as well as the latest windows operating systems. Auto install software makes set-up a breeze through USB connectivity. Capture and store images at school, work or home. Pebble HD’s small lightweight design makes it the perfect companion whether you’re traveling or at home. Easily read labels,prescriptions, price tags, menus, bus schedules and so much more with this ultra-portable low vision video magnifier. Carry Pebble HD in your pocket, purse or strap it onto your belt, the only time you’ll know its there is when you need it. Pebble Mini’s ultra-compact design makes it the ideal hand-held magnifier whether you’re at home or on the go. Easily read prescriptions, mail, labels, price tags, menus and so much more. The Amigo Low Vision Electronic Magnifier is simple to use–just place it directly on the material and adjust the magnification by a turn of the dial. 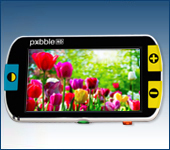 This innovative low vision product incorporates a 6.5 inch viewing screen with a wide field of view. You have to try the most popular portable low vision solution available! (888) 811-3161 or complete our online request form.